Brian Jarvi’s AFRICAN MENAGERIE is a traveling museum exhibition of epic scale, 15 years in the making. 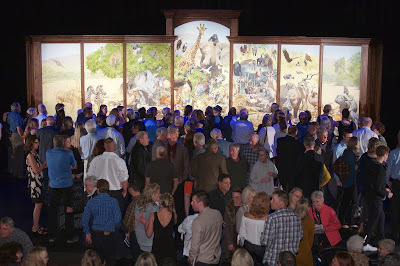 The centerpiece of the exhibition was unveiled for a preview on September 16, 2017 at The Reif Center for the Performing Arts, in Grand Rapids, MN, near the artist's home and studio. Over 800 people attended the standing-room-only event. 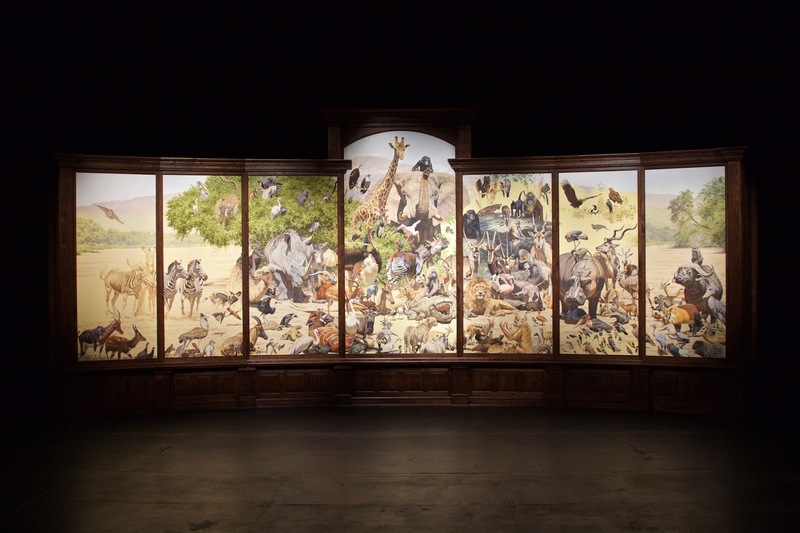 The centerpiece of Brian Jarvi’s AFRICAN MENAGERIE is comprised of seven interlocking panels, housed in rich walnut cabinetry that form a sweeping, grand panorama 32 feet wide by 14 feet high, depicting the African savannah and the animal kingdom contained therein. Over fifty related research sketches and mixed media studies (approximately half of the artist's output for the project), many of them large, surround the panorama. 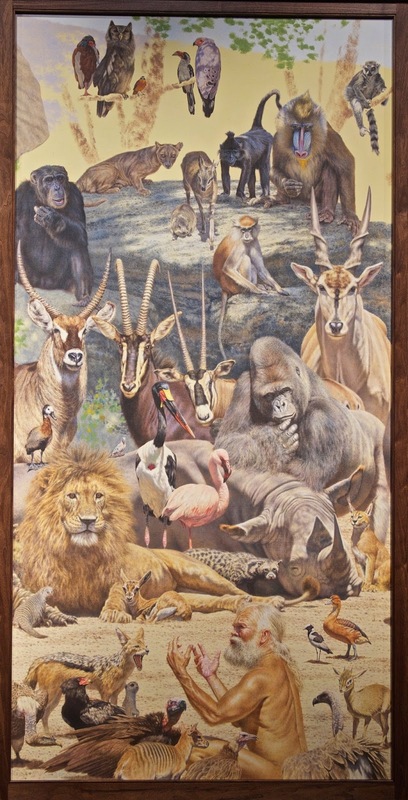 Brian Jarvi, who is an award-winning member of The Society of Animal Artists, is widely recognized among the very best painters of African wildlife today. 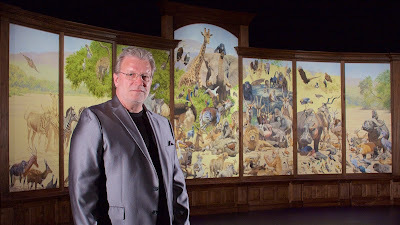 His concept for ”African Menagerie" was spawned from early childhood memories and fascination with both living collections of wild animals, and paintings from the distant past portraying large varied groups of exotic creatures. 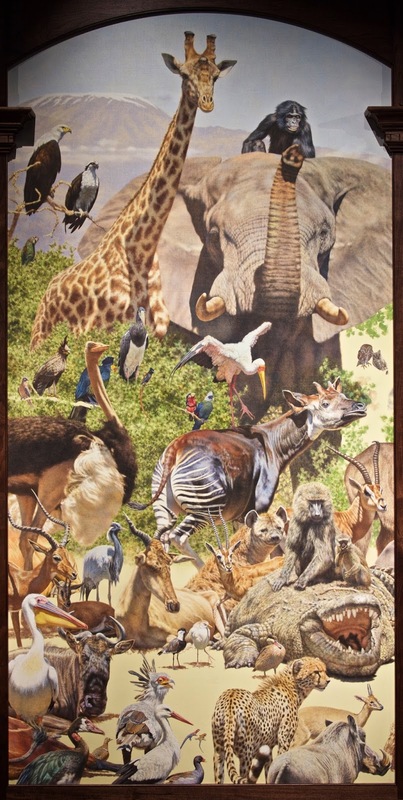 In his "Menagerie," the gathering of an incredible array of wildlife is set against a grand panoramic backdrop of the receding snows atop Mount Kilimanjaro. 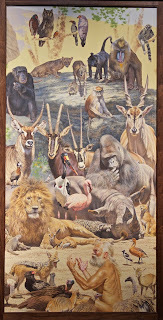 All of Africa's icons including the Elephant, Leopard, Giraffe, Rhino, Hippo, and Zebra mingle with such exotics as Bongo, Okapie, and Mandrill, which gaze directly at viewers, in a way that reveals the artist's subtext for the exhibit, namely an Inquisition of Homo sapiens and the plight of threatened and endangered wildlife species. The project’s storyline was calculatingly intended to dramatize the urgency of the moment to save not just the great iconic species of Africa, but also wildlife across all of our shrinkingly, diverse, environmentally-threatened planet. 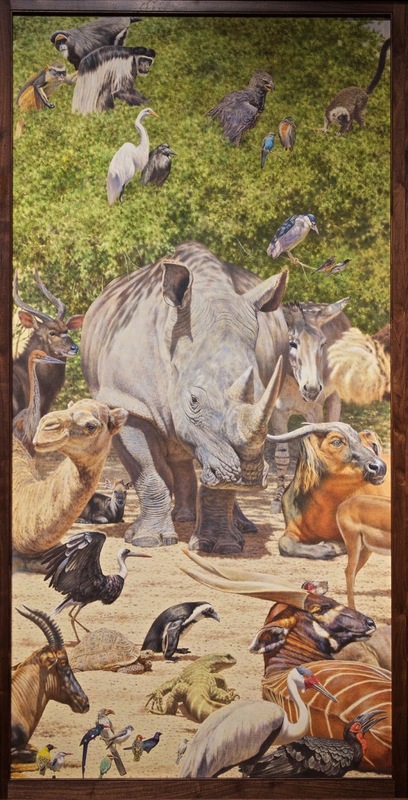 In preparation for the creation of "African Menagerie," Jarvi created more than 100 studies in pencil, charcoal, monochromatic oils, mixed media as well as major full-color oils of a multitude of species, six of which have been juried into major exhibitions including The Annual Exhibition of the Annual Exhibition of the prestigious Society of AnimalArtists. Documenting the project will be a coffee-table book by Todd Wilkinson, author of such books as Last Stand: Ted Turner's Quest to Save a Troubled Planet, and Kent Ullberg: Monuments to Nature. The book is pending publication by Rizzoli Publications, New York. 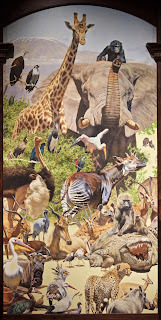 The complete exhibition of AFRICAN MENAGERIE is scheduled to premiere at The Sternberg Museum of Natural History, Fort Hays State University, KS from October 1 to December 21, 2017; and tour from January 20 to April 5, 2018 at the Hiram Blauvelt Art Museum, Oradell, NJ in the New York City Metropolitan area; and from April 26 to July 15, 2018 to Canton Museum of Art, Canton, OH. Additional Venues are pending. Tour Produced by David J. Wagner, L.L.C.